What a difference the right tool or appliance can make! For instance, we were late arrivals to the pressure-washer party, but now that we have “bellied up to the bar”, we’re having a blast… of water. Last year’s purchase of a pressure washer has made our lives so much easier, in so many ways and so many places. But of course our initiation into the joys of pressure washers began with a problem: we had some outdoor carpets that were turning green from algae growth, and none of our conventional cleaning methods would remove the discoloration, especially on the bindings. We tried using a high-power nozzle on a regular garden hose, attempted various spray-on cleaners and commercial spot-removers, and even brought our trusty carpet steamer outside—all to no avail. Some friends of ours suggested we try using their pressure washer, and voila: stains removed, outdoor carpets saved! 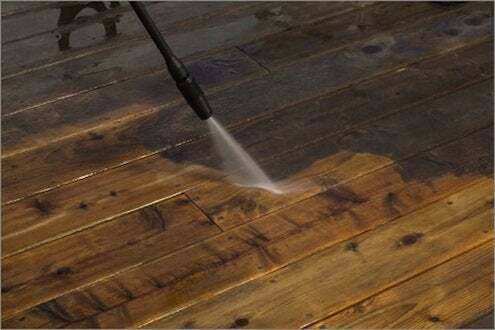 We immediately began looking for our own pressure washer (also known as a power washer), shopping at major home improvement stores, hardware stores, and garden centers. We found that there are myriad models from which to choose, at prices ranging from $200 to $2,000. Pressure washers are rated according to the water pressure that they produce. Most standard garden hoses deliver between 40 to 60 pounds per square inch (PSI), while pressure washers deliver from 1,400 to 4,000 PSI. A pressure washer takes the water from the garden hose and pressurizes it through a small high-pressure nozzle, creating a supercharged jet of water that can be used alone or combined with a cleaning agent. 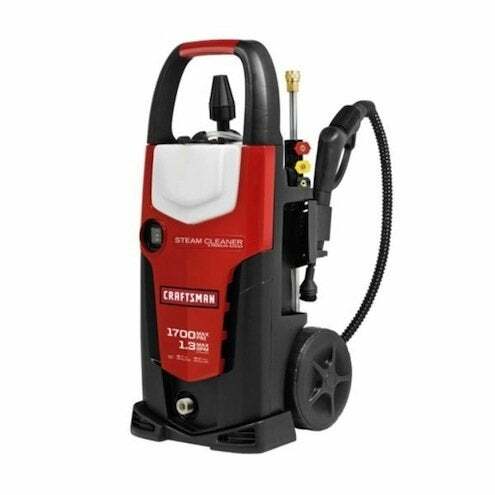 • Light-duty pressure washers are rated at 2,000 PSI or less and are suitable for cleaning automobiles, motorcycles, boats, bicycles and all-purpose cleaning. • Medium-duty pressure washers produce 2,000 to 3,000 PSI and can be used to remove grease and grim from concrete, sidewalks, decks and siding. 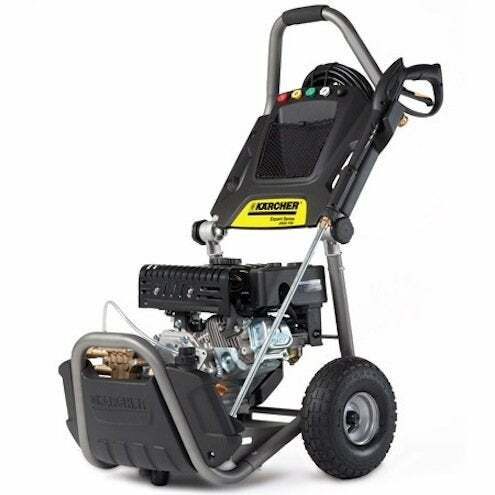 • Heavy-duty pressure washers produce 3,000 PSI or more, and can be used to clean large areas quickly, remove stubborn stains or patches of rust, or to strip paint. There are also a variety of commercial pressure washers on the market, but if you have a job that extensive, you probably would be better off calling in a professional pressure washing service. Another key factor in choosing a pressure washer is how much water it puts out, which is known as the flow rate and is expressed as gallons per minute (GPM). The higher the flow rate the faster a pressure washer will clean a given area. Most residential pressure washers have a flow rate of 2 to 4 GPM. Interestingly, using a pressure washer actually can save substantially on water usage. A garden hose operating at 60 PSI uses about 900 gallons per hour, while a pressure washer operating at 1,400 PSI only uses about 100 gallons per hour. Light-duty pressure washers typically are electric; heavy-duty pressure washers are gas-powered. We chose an electric-powered, medium-duty pressure washer rated at 2,000 PSI, because we figured it would be the most versatile for home and garden use, and we have been quite happy with our choice. We’ve used the pressure washer to clean our deck, including the railings and stairs; to remove stubborn stains from the driveway; to clean siding and brick walls; to clean and flush our gutters; as well as to clean our cars, bikes, lawn mower, snow blower and lawn furniture. The pressure washer even removed baked-on grease from the cast iron grates of our grill. And of course, whenever those outdoor carpets start to look a little dingy, we bring out the trusty pressure washer. My only regret is that we didn’t buy one sooner!